In the modern era of presidential campaigns, even with candidates’ every last word and action carefully scripted, there can still be surprises. This year, that surprise came in the form of an interloper named Sandy, a blustery blowhard whose campaign stormed up the East Coast and made bombastic statements all along the way, treating red and blue states with equal disrespect. In the process, Sandy emphatically impacted the race for the presidency. First, she forced both President Obama and Mitt Romney to alter their campaigns while she commanded the attention of most of the Atlantic seaboard. They both had to step away from key battleground states, as the president canceled campaign stops in Florida and Wisconsin and Romney called off events in New Hampshire, Iowa, Ohio, and Wisconsin. The negative rhetoric between the two candidates was toned down while both focused their attention on the storm and its victims. Still, the greatest impact may be on public attention. Go to any news website or flip on any cable news channel, and Sandy is the dominant story by far. No one is talking about tax cuts or unemployment or immigration. 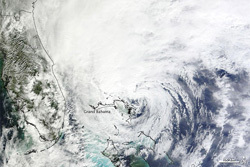 Television has a tendency to overhype major storms, but given the breadth and destructive power of Sandy, the saturation coverage seems to match its magnitude. The devastation that Hurricane Sandy brought to New York City and much of the Northeast—in lost lives, lost homes and lost business—brought the stakes of Tuesday’s presidential election into sharp relief. . . .
Our climate is changing. And while the increase in extreme weather we have experienced in New York City and around the world may or may not be the result of it, the risk that it might be—given this week’s devastation—should compel all elected leaders to take immediate action. . . . When I step into the voting booth, I think about the world I want to leave my two daughters, and the values that are required to guide us there. The two parties’ nominees for president offer different visions of where they want to lead America. . . . If many other voters share Bloomberg’s perspective that immediate action on climate change is necessary and the President is more likely to take that action, then Barack and Mitt may come to see Sandy as the October surprise that decided the election.